This hunt is on 1 x 1 basis. Each professional hunter has his own vehicle and a team of trackers and porters. All safaris are scheduled with one or maximum three hunters per camp. On our 15-day safari, days 1 and 15 are transfer days. This means, there are 13 full days of hunting with some possible hunting on arrival and departure days, depending on domestic flights schedules. 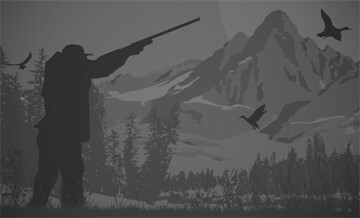 Since 1995 hunting has been selective and very conservative, which resulted in a dense game population and record-able trophies. The trophy lengths of the collected Derby elands all exceed 461/2 inches or 118 cm (Rowland Ward: spiral measurement) with a record, shot in 1997, of 531/4 inches or 137 cm. (Cameroon n° 1 (Rowland Ward ed. 2002)). The length of the lions varies from 1121/2 to 1196/8 inches (285 to 303 cm). The trophies of the western roans are between 24 and 299/8 inches (61 and 76 cm) and those of western bushbuck 99/8 and 15 inches (25 and 38 cm). This Safari is 10 days long on a 1x1 basis for 2 of big game species (group I.) and 4 other single species from group II. or III. Group I.: Northwestern buffalo, Hippopotamus, Elephant, Western roan, Western bushbuck Group II. : Western hartebeest, Waterbuck, Bohor reedbuck, Western kob, Red river hog, Warthog Group III. : Western bush duiker, Red Flanked duiker, Oribi, Baboon, Civet, White-tailed mongoose, Genet, Ichneumon (Egyptian mongoose), Python, Viper, Spotted hyena One single animal per species and only males can be shot.